My day in Istanbul was one of the highlights of a Mediterranean cruise I was on. It also was the first city I’ve visited that gave me a little culture shock. The skyline was so different from any other city I had been to, minarets reaching up everywhere. The sheer amount of people and racing taxi cabs was a jolt to my Canadian senses, being so used to wide open spaces and slower paces. Initially overwhelmed with the size and culture, I soon settled in to make the most of my 24 hours in Istanbul. As often the case with cruising, one day in Istanbul was not nearly enough. Even though my time in Istanbul was limited (the cruise ship arrived around 5:30 pm then sailed away the next evening), I still managed to see quite a lot of this magnificent city. It helps that a lot of Istanbul’s main attractions are within close distance of each other, making it easy to see a good amount of Istanbul in 24 hours. A parade greeted us as we got off the cruise ship. Before I share with you the places to see in Istanbul in one day, here’s a brief background of the city. Istanbul is often referred to as where East meets West. It’s the only city in the word built on two continents- the Bosphorus Strait splitting the city in two, dividing Europe from Asia. Most visitors to Istanbul spend their time on the European side, since this is where the historical and commercial districts are. Parts of Istanbul’s historical areas have been listed by UNESCO as a World Heritage Site. View from the Asian side of Istanbul. Over its history, Istanbul has been the capital of four different empires- The Roman Empire, Byzantine Empire, Latin Empire and Ottoman Empire. The city has also had a revolving door of names. It was founded as Byzantium, then renamed Constantinople and finally Istanbul. The city is unique in that it has retained features of both the Christian and Islamic Empires (a visit to Hagia Sophia and you will see what I mean). Today Istanbul is Turkey’s (and Europe’s) most populous city, with over 15 million people calling it home. There are so many places to see in Istanbul that narrowing it down can be tough. To make the most of my time, I stuck to visiting Istanbul’s main tourist sites. Here are the highlights of my whirlwind tour of the historic areas of Istanbul. 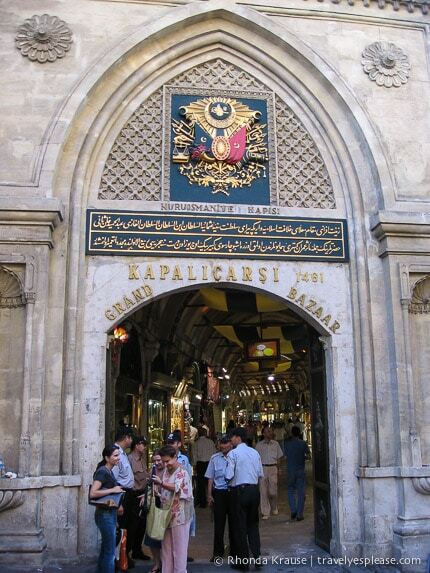 The Grand Bazaar is of the largest covered markets in the world, with over 4,000 shops spanning 60 streets. You will find everything here from carpets and leathers to jewelry and ceramics. Half the fun of visiting the Grand Bazaar is the haggling. The shop owners would tell me a high price at first and then I’d offer them half the amount. They would say no, so I would start walking away saying I was off to look for a better price. They quickly would call me back and accept my offer. I got myself some good deals! I had kind of a funny experience at the Grand Bazaar. One of the guys I bought from said jokingly to my boyfriend at the time, “You’re a lucky guy” and then asked him to “name his price in camels.” My boyfriend said I wasn’t for sale but the shop owner still tried to barter with him. I thought it was hilarious and was laughing the whole time (you could tell he was just joking around…at least I hope he was joking around) but my boyfriend sure did not find it funny! Home to the Ottoman Sultans for about 400 years, Topkapi Palace is a must see when in Istanbul. The palace is a complex of four main courtyards with smaller buildings throughout. Topkapi Palace houses many treasures- ornate thrones (which were short but wide), the Sultan’s clothing and their jewels. Make sure to visit the Treasury to see the “Spoonmaker’s Diamond”. At 86 carats, the pear shaped diamond is a stunner! I’m disappointed I wasn’t allowed to take a picture. I thought this was the most incredible looking building, unlike anything I had ever seen. The Blue Mosque (Sultan Ahmet Mosque) has six minarets, one main dome and eight smaller, cascading domes. The mosque gets it’s popular name from the 20,000 hand made tiles that adorn the inside. To visit, you are required to take off your shoes and cover your knees and shoulders. The floors are all carpet and the inside is decorated with low hanging, candle chandeliers. It was very beautiful and unique, but honestly, the smell of hundreds of sweaty feet made me want to leave pretty fast. Hagia Sophia should be number one on your list of things to see when visiting Istanbul. It is incredible, both in its appearance and history. It is now a museum, but once was a Christian church before being converted into a Mosque. You can see elements of both Christian and Muslim faiths in the decor and architecture. The Hagia Sofia is famous for it’s massive dome, which unfortunately was covered with scaffolding when I visited (it seems like everywhere I travel, scaffolding ruins my view). Don’t be afraid to haggle for a better price in small shops and bazaars. It’s common for the quoted price to be up to three times the item’s actual value. When taking a cab, always insist the driver use the meter. Do not agree upon a fixed price to your destination. What happened to me and my travel companions was once we arrived at our destination, the driver demanded more money than we had agreed upon. As of April 17, 2013, electronic visa (e-Visa) replaces “sticker visa” which was issued at the border crossings. Ordinary passport holders can obtain three-month multiple entry e-Visas via the website www.evisa.gov.tr. When I visited, cruise passengers coming to a Turkish port of call by a cruise ship, and leaving Turkey by the same cruise ship for another country, are exempt from visa for a maximum period of 72 hours (with the permission given by the local security authorities). Check with your cruise line, travel agent, or this page for more information about visas. * Information was correct at the time of publishing but can change without notice. Please confirm directly with service providers. For quick and convenient access to Istanbul’s attractions, here is a trusted vendor where you can buy advance, mobile tickets to the sites mentioned in this post. Digital ticket delivery is instant and you can show your phone at the ticket holders entrance- no need to print your tickets. For your convenience, here is a list of hotels in Istanbul. Please consider booking your Istanbul accommodations through the included link. It costs you nothing extra and helps support this website. Thank you!